Lab grown diamonds market is one of the growing markets across the globe. These diamonds are called as synthetic, culture or cultivated diamonds. Lab grown diamonds are manufactured in laboratories using various technological processes. Synthetic diamonds can be designed and modified according to the requirements or users. Manufacturing of lab grown diamonds is associated with low cost cultivation techniques as compared to cost of natural diamonds. Absence of mining and fewer complexities related to manufacturing of synthetic diamonds makes it cost effective for the various end-use industries. The market of lab grown diamonds was valued at USD 16.2 Billion in 2015. 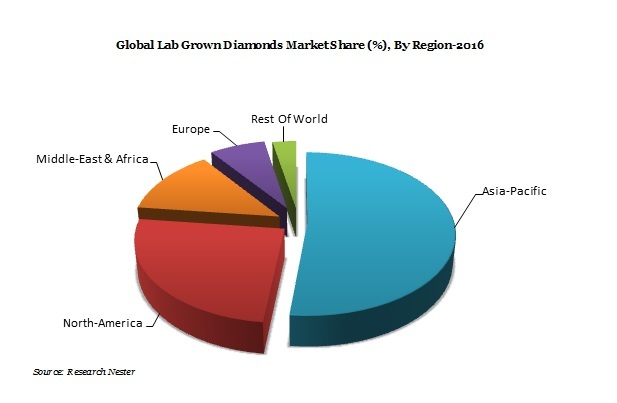 Moreover, by the end of 2023, the global market of lab grown diamonds is expected to garner USD 27.6 Billion by registering a CAGR of 7.4% during the forecast period i.e. 2016-2023. Adoption of synthetic diamonds in various industries on account of their properties and rising acceptance of lab grown diamonds among the population in developing nations are the major market driven factors for the growth of lab grown diamonds. Asia-Pacific region has appeared as the largest market for lab grown diamonds on the back of rapid urbanization which gives rise to rapid expansion of construction and mining industries. Further, these industries are adopting cost-effective and advanced products for various applications which are fulfilled by the lab grown diamonds. Moreover, the market of Asia-Pacific region accounted the largest revenue share of 51.2% in 2015 and it is expected to maintain its dominance over the forecast period i.e. 2016-2023 on account of rising demand in end-use industries. Moreover, rapid pace urbanization across the globe and increasing number of jewelry industries are shifting towards the cost effective and high quality products such as lab grown diamonds for various applications. Although, lab grown diamonds helps various end-user industry to increase profit in near future on account of rising popularity and wide scale applications of synthetics diamonds in end-use industries. It also benefits the consumers in terms of design according to the requirements at low cost. However, slow adoption of lab grown diamonds and negative impact on economy in many nations are the major challenges for the market of lab grown diamonds. Rapid development of electronics industry across the globe is assisting as a major opportunity for the synthetic diamond market. Lab grown diamond grows importance in various industries on account of various excellent properties such as electrical chemical, thermal and optical. Moreover, the physical property of rigidity in lab grown diamonds establishes the significance in various cutting and manufacturing industries. Additionally, rising popularity of lab grown diamonds, large scale availability, introduction of colored synthetic diamonds which can be used as gems in jewelry industry and similar appearance of lab grown diamonds as natural diamonds are some of the major growth drivers for the industry of lab grown diamonds. Furthermore, the market is majorly driven on the back of emerging coal and mining industry and growing demand of synthetic diamonds in various end-use industries. Cost-effectiveness of lab grown diamonds and rising environmental concerns related to mining along with strict regulations to extract natural diamond gives rise to the manufacturing of synthetic diamonds. Conversely, key restraints for lab grown diamonds market are presence of complexity in manufacturing process and cynicism about the quality among the end-use industries and users. The factor slow adoption of lab grown diamonds and lack of awareness in various end-use industries are hindering the growth of lab grown diamonds across the globe.